Groomsmen mason jars are a great personalized best man and groomsmen gift idea. 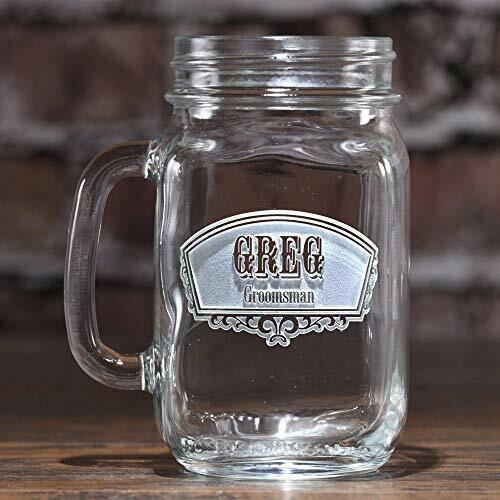 Engraved Mason Jar Mugs are an excellent wedding favor, wedding gift or something special for your bridal party attendants and while we list these as a cool groomsman gift, they're great gifts for the bridesmaids as well. Personalized mason jars are an enjoyable way to serve up your mixed drinks, draft beer, iced tea, soda and more at your country outdoor wedding or any country themed wedding venue. These monogrammed handled jars create a fun way to bring a little country into your home or bar and are popular country wedding day favors. Because these vintage style mason jars are so versatile, we have created unique and fun designs that are suitable for everyone and every gift occasion. These classic-styled Mason drinking jars with handles are durable and long lasting and will add character and charm to your drink ware and home bar or kitchen assortment or are great vessels for crafters. Our engraving process is actually called sand-carving. It's a unique process that blasts away a background design, leaving the monogram initials and lettering untouched and raised from the mason jar surface in a stunning 3D manner. These wedding favors and gifts are truly unique and the quality is unmatched by simple engraved and etched styles. Dimensions: top diameter: 2 5/8", bottom diameter: 2 1/2", maximum diameter: 4 1/8", height: 5 1/4", capacity: 16 oz. Made in the USA. Not recommended for use with hot beverages. NOTE: Sample titles you can choose for personalization: bride, bridesmaid, maid of honor, matron of honor, mother of the bride, mother of the groom, groom, best man, groomsman, usher, officiant, father of the groom, father of the bride.